Istana Nurul Iman was included in the Guinness Book of Records as the world's largest living residence of a state head. Indeed, it is the biggest palace and royal residence of the world. This massive royal dwelling is several times larger than the Palace of Versailles and the Buckingham Palace. The Palace is the house of Brunei’s sultan Hassanal Bolkiah. 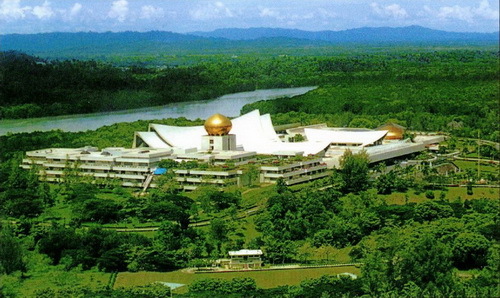 The palace stands on the banks of the Brunei River, several kilometers south of Brunei’s capital. Istana Nurul Iman is a massive white construction with golden domes and minarets. Breathtaking views of the palace open from the nearby Persiaran Damuan Park. Curved roofs of the buildings and the huge golden dome of the palace mosque rise over green trees. It is also worth to enjoy the looks of this extravagant palace while taking a boat trip on Brunei River. The name of Istana Nurul Iman means Palace (from Malay Istana) of the Light of Faith (Arabic` Nurul Iman). The palace was built in two years and finished to the attainment of Brunei’s independence from Britain on January 1st 1984. More than 1 billion dollars were spent on its construction. The architect of the Palace’s exterior was Leonardo V. Locsin, who tried to unify Brunei’s Islamic and Malay architectural traditions in the design of Nurul Iman. The designer of the interior was Khuan Chew, who also worked on the construction of Burj Al Arab in Dubai. The architecture of the Sultan’s residence is a blend of European and traditional Malay architecture. Italian marble, granite from Shanghai, English glass and the best Chinese silk. Gold and marble were the main decoration materials of the Palace. 38 different kinds of marble were used for the decoration of its interior. There are 44 staircases made from marble. The Palace contains 1788 premises. The whole palace contains 200,000 square meters of space. The mosque of the palace can accommodate up to 1500 people, while the banquet hall can provide space for over 5000 guests. The palace even has a helipad, 5 swimming pools and more than 250 bathrooms. Istana Nurul Iman is the official residence of the Sultan of Brunei and his family, as well as the location of the senior government offices of the country. The palace is hosting the most important governmental bodies, including the office of Brunei’s prime-minister.